In 1937, Army Quartermaster Captain Paul Logan began looking for a new lightweight field ration for troops in emergencies or on long field deployments. Logan thought chocolate bars might work and approached Hershey’s about creating the perfect, indestructible candy. The requirements were simple: The bar had to fit in a pocket, come loaded with enough nourishment to keep troops going, and be capable of withstanding extremely warm temperatures without melting. But most importantly, the chocolate couldn’t taste very good. Logan didn’t want his men scarfing down the treats before a true emergency, so he specified that the rations should taste “a little better than a boiled potato.” Each soldier would receive three bars as his full day’s provisions. Despite the atrocious flavor and texture, the D-ration and a reformulated, slightly tastier version, the Hershey’s Tropical Chocolate Bar, kept Americans fighting through World War II. Hershey’s cranked out 24 million bars each week. 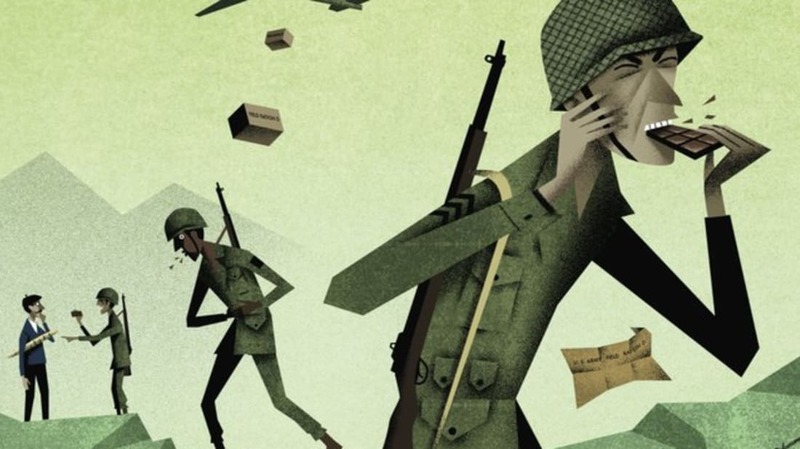 Turns out soldiers weren’t always eating the bars, though—many realized they could trade the chocolate with unsuspecting civilians for better grub.